A Rothwell school placed in special measures just two years ago has received high praise fom Ofsted after a rapid turnaround. Montsaye Academy in Greening Road has gone from the worst possible grade in December 2016 to the second best grade, ‘good’, in a report published yesterday (Tuesday). 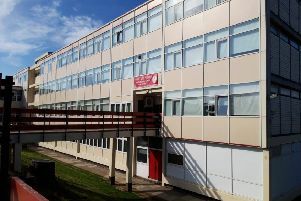 An inspection found the school had made rapid improvements in the quality of its teaching. Principal Meena Gabbi, who has been in the role for just under 18 months, said she was delighted with the recognition - but that they’re still striving to be even better. She said: “It doesn’t stop here – we know there is still work to do. “We want this report to act as a springboard for the next stage in the story of Montsaye. The school, part of the Montsaye Community Learning Partnership (MCLP), was previously criticised for having inadequate leadership. In his report, lead Ofsted inspector Chris Stevens said this was no longer the case. Mrs Gabbi said the hard work and dedication of staff, parents and students had paid off. She said: “This result is just the latest chapter in our school’s recent achievements. The MCLP also received praise from Ofsted for its effective support of the school. Ann Davey, chief executive officer of the MCLP, paid tribute to the hard work and commitment of the team. She said: “We cannot praise Montsaye Academy staff, pupils and parents highly enough for their tenacity, resilience and untiring determination.